Cirel's state of the art Preamplifiers enable MEMS microphone integrators to develop narrow sensitivity tolerance microphones enabling excellent microphone performance and matching. 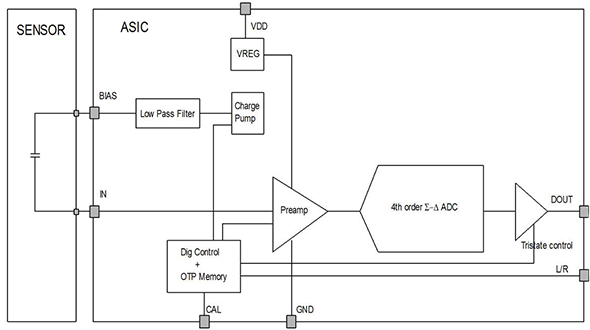 Both analog and digital MEMS mic preamps are available and have been shipped in large volumes. 1. Ultra low noise requirement was the main challenge in the design across audio band without using any external components. 2. Realization of high voltage functions to bias the sensor while keeping the power consumption under control was another challenging requirement. 3. Ultra low power consumption less than 150uA was an important requirement as mics are usually used in hand held, battery operated devices like mobile phones, digital still cameras etc. 4. A robust mechanism to calibrate the sensor & preamp was a key requirement and the main motivation for the new ASIC. 6. Immunity to supply noise - > 70dB PSRR. 7. Maintaining output DC level in a system without DC feedback. 3. 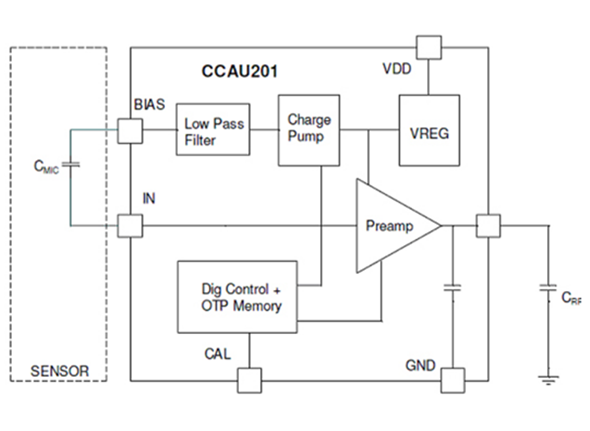 A charge pump and power on reset circuit were integrated based on power management IP portfolio.